Bringing up playful puppies, especially a German Shepherd puppy, can be lots of fun and also very, very challenging. The simple act of owning a GSD puppy is full of many responsibilities. Bringing that puppy up to be a confidant, well adjusted and well socialized dog is of the utmost importance. So, below I will list 3 simple "games" to practice with your German Shepherd puppy soon after you get it home. Each of these will act as a bridge leading to more advanced puppy training methods down the road. They will also enhance the bond between yourself and your new playful puppy. This is a really fun game to teach your GSD puppy to come to you when called. 1. First, put your German Shepherd puppy in a sit-stay (or have someone else hold him) and hide behind a nearby tree or a piece of furniture. Wait a few seconds, then call him to you in a high pitched and excited manner. 2. 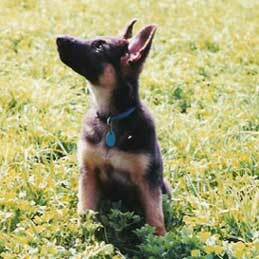 Once your German Shepherd puppy "finds" you, praise him, praise him, praise him. To make this progressively harder, make each hiding place a little harder and a little farther away from you than the one before. This game is a great way to teach early smell discrimination training. This works best, especially in the beginning phases, if you have a helper to hold your GSD puppy. 1. Have your helper hold your German Shepherd puppy and let them both watch as you put several objects on the floor just in front of them, such as: a coke can and an empty toilet paper roll. Make sure you're wearing a plastic glove if possible while touching the items. You'll need to have (and hide) a favorite toy of your pups (in your back pocket, possibly) as well while doing this. 2. Now, walk back to your Alsatian puppy and your helper. Casually retrieve the pups favorite toy from your back pocket, rub your hands on it for a few seconds, and let him watch as you throw it over near the other objects you've just laid out. 3. Now, have your helper release your puppy and tell him to "Fetch!" As soon as he picks the toy you just threw, praise him tremendously. Just as soon as your puppy gets good at selecting his toy from the others, get one of your old socks (infused with your scent) and use this in place of his favorite toy. An advanced method would be to use only like shaped objects, such as all socks or all gloves, that do not have your scent (freshly washed) - except for the one you want your German Shepherd puppy to fetch (the one that does have your scent). If you practice this often enough eventually the methods of scent discrimination will be a part of your lives and something you can use later on - particularly if you have a puppy you eventually hope to use in hunting or obedience work. Teaching playful puppies any kind of new tricks takes both dedication, persistence and patience but can be incredibly rewarding - and fun as well. The more time you put into your GSD puppy now, the more rewards you will get from it in the future.